Citation Information: J Clin Invest. 2002;109(5):621-628. https://doi.org/10.1172/JCI14097. The CC chemokine receptor 3 (CCR3) is expressed by eosinophils, mast cells, and Th2 cells. We used CCR3–/– mice to assess the role of CCR3 in a murine model of allergic skin inflammation induced by repeated epicutaneous sensitization with ovalbumin (OVA), and characterized by eosinophil skin infiltration, local expression of Th2 cytokines, and airway hyperresponsiveness (AHR) to inhaled antigen. Eosinophils and the eosinophil product major basic protein were absent from the skin of sham and OVA-sensitized CCR3–/– mice. Mast cell numbers and expression of IL-4 mRNA were normal in skin of CCR3–/– mice, suggesting that CCR3 is not important for infiltration of the skin by mast cells and Th2 cells. CCR3–/– mice produced normal levels of OVA-specific IgE, and their splenocytes secreted normal amounts of IL-4 and IL-5 following in vitro stimulation with OVA, indicating effective generation of systemic Th2 helper responses. 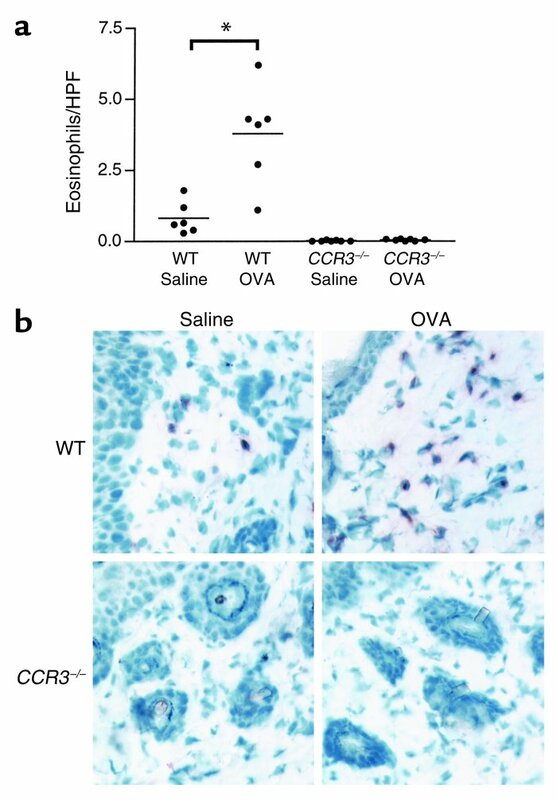 Recruitment of eosinophils to lung parenchyma and bronchoalveolar lavage (BAL) fluid was severely impaired in CCR3–/– mice, which failed to develop AHR to methacholine following antigen inhalation. These results suggest that CCR3 plays an essential role in eosinophil recruitment to the skin and the lung and in the development of AHR. Eosinophils are virtually absent in OVA-sensitized skin sites of CCR3–/– mice. (a) Eosinophils/HPF in skin sites of CCR3–/– mice and WT controls sensitized with either OVA or saline. The bars represent the mean (n = 6–7 animals per group). *P < 0.01. (b) Immunoperoxidase MBP staining of sensitized skin sites from CCR3–/– mice and WT controls. MBP stains brown.